How is your week so far? I hope good. The weather has been very pleasant in my part of the world. We visited the park on Saturday where Mouse got to play in the water with a neighbor boy who is just a few months younger than she is. For Father's Day, we treated my husband to doughnuts and lunch out. We also went shopping for a new computer as his old finally gave out. He was able to use gift cards he had received for the past several holidays to pay for it. Gift cards make the best gifts! Well, besides books. I had the chance to see the movie Maleficent this weekend and really enjoyed it. I love these fairy tale re-tellings in which the villains get a back story all their own. 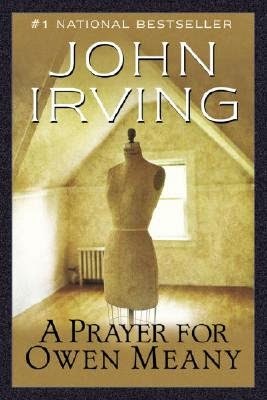 At the moment, I am reading A Prayer for Owen Meany by John Irving for Carrie's "I've Always Meant to Read That Book!" Challenge of which I have failed to finish the last two books I wanted to read for the challenge in a timely fashion. So, far, I confess, I am not enjoying Irving's book. So many of you love it, I know. I feel like I should too. There are moments in the novel when I think, "Oh! Maybe this is the moment when I will become hooked!" And then it unravels from there. I am debating whether to finish the novel at all at this point. I am about a third of the way through. At least with Atwood's book, I enjoy it when I am reading it--it's picking it up again after I set it down that is the problem (and then I forget to bring my Nook to work--and so I only have my Kindle to read during my lunch hour). This is why I have been reading other books in between . . . I am doomed to remember a boy with a wrecked voice--not because of his voice, or because he was the smallest person I ever knew, or even because he was the instrument of my mother's death, but because he is the reason I believe in God; I am a Christian because of Owen Meany. I make no claims to have a life of Christ, or with Christ--and certainly not for Christ, which I've heard some zealots claim. I'm not very sophisticated in my knowledge of the Old Testament, and I've not read the New Testament since my Sunday school days, except for those passages that I hear read aloud to me when I go to church. I'm somewhat more familiar with the passages from the Bible that appear in The Book of Common Prayer; I read my prayer book often, and my Bible only on holy days--the prayer book is so much more orderly. Glad to hear your week is going well, that your having good weather. I'm not familiar with A Prayer for Owen Meany so will check it out. Busy reading The Secret's Women Keep by Fanny Blake which so far is a so-so read. Tracy - A Prayer for Owen Meany is considered a modern classic and is quite popular. I saw the movie based on the book years and years ago. I'm afraid I don't remember much of it, but I think I liked that at least. Hopefully the book will pick up for me. This is one that I've "always meant to read," but never gotten around to. I love the opening paragraph, so I probably would keep reading. I'm not sure I will ever get around to it, though. I want to see Maleficent, too. I'm a sucker for fairy tale re-tellings. I just finished The Supernatural Enhancements by Edgar Cantero; it was from NetGalley, and i really enjoyed it! It would make such a good RIP read. Jenclair - I figured if Carrie was reading it, I might as well too since I'd been meaning to. I hope you do get to see Maleficient! I've heard so many great things about that book but just didn't get around to reading it. It must be I wasn't in the mood when it first released, and then that interest passes as the years goes. Maybe one day. Oh, I'd like to watch Maleficent! I'm always interested to read or watch a re-telling fairy tales, especially from the villain's POV. I'm currently reading a women fiction titled Covet. It's about a woman who finds her marriage on the rocks with a workaholic husband. An encounter with a cop has made her heart flutter and I'm interested to know where the story will lead me, since she has two kids and apparently she still love her husband. Melody - I almost gave the book away when we moved three years ago because I wasn't sure I would ever get to it. I'm not sure I'd be reading it now if it weren't for Carrie's challenge. I think you'd really like Maleficent, Melody. I hope you get to see it. Your girls might like it too, at least your older one. I think Mouse would be scared still. Covet sounds interesting! I hope you enjoy it! It sounds like your husband had a great Father's Day! Our families usually give us cash for gifts and we always save it for a big purchase like that - makes it much less painful and also kind of fun. You must continue with Owen Meany - it is SO good! Kathy - He did. And he really likes his new computer. :-) My husband is good about saving up his gift cards and cash gifts for big purchases like that. I'm not always so, though. I need to work on that. I like the narrator's voice...but I don't know that I would read this one. I hope you enjoy it. Thanks for visiting my blog. Laurel-Rain - I am hoping I start enjoying it too! This is one of my all-time favorite books. Sorry you're not enjoying it. As I recall, the best part is towards the end. Catherine - It's so disappointing because I feel like I should love it since so many others have loved it. I don't think I'll end up loving it at this point, but maybe I will like it when I finish it. Hopefully. I've never heard of Irving's book, but I'm sorry to hear you're not enjoying it. I'm all too familiar with being the one dissenting voice about a novel. As for me, I'm reading Anne Ursu's The Real Boy. It's a middle grade book, and I think my older two girls might like it. A.M.B. - It does have its moments, which compel me to keep at it. Hopefully, like others have said, the ending will make it worth the time and effort I'm putting into reading it. I am not familiar with The Real Boy. I'll have to look it up. It never hurts to start a list of books my daughter might be interested in at some point in the future. Truthfully, I did try out this book since it gets such rave reviews from so many bloggers. Alas, I just couldn't get into Irving's literary style. That's a reflection of me, not the actual quality of the book. Anyway, I can relate to you having trouble. I did enjoy the movie version of it years ago. Hope you find some fun books to read this week! Rita - Not every book is for every reader, right? It's nice to know I'm not the only one who isn't sure about this one. Sorry this one isn't working for you! It has such a pretty cover. I can see why you picked it up more than once. Thanks for stopping by. I tried this book twice and did not finish either time. It is one of my daughter's favorites. Just started Written In My Heart's Own Blood. JoAnn - I hope so too! I am enjoying parts of it, which is better than nothing, right? Ugh. I had such high expectations of Owen Meany, but for me it was just okay. I think the way people go on about it ruined it for me. I wish I hadn't gotten rid of it though. There are parts of it I would like to revisit. Rachel - I wonder if that's what it is in part. My expectations are too high given all the praise the book has gotten. I know what you mean about wanting to revisit parts. I highlighted a couple quotes as I was reading that stood out for me. That doesn't happen often when I read. Oh what a shame you're not enjoying this book. I fall into the camp of people who loved it but I also believe if it isn't for you put it down and find something else. Cleo - I'm so tempted to just give up, but I think I'll give it a little while longer before deciding for sure. There are moments when I am enjoying the book. Maybe there will be more as I go. Oh - this is one of my favorite books of all time! However, I see how you are having trouble getting into Irving…my mom hates his stuff! Some of his topics are just a little odd, but I just love his writing style so much that I could pretty much read him writing about anything. Sarah - This is my first Irving book, and so I'm not too familiar with his writing. I wonder if I would like something else he's written more . . .
Maleficent sounds like a great movie. Can't wait to see it! Stephanie - Maleficent was a little different than I expected, but I thought it was well done. I loved the story. It's one of those movies I can't wait until my daughter is old enough to watch. It doesn't really sound like my kind of book. I'm sorry you are having a hard time with it. I hope it gets better for you. I have it because it was a kindle daily deal right after a bunch of people raved about it at book club but I haven't read it yet. The blurb has never really grabbed me. I'm glad to know it isn't an instant love for everyone. That way I won't feel bad if I don't love it when I eventually read it! I really want to see Maleficent! I'm not really a movie person but this one sounds great. Yay for your husband's computer! What fun to stack up all those GCs and so agree that they make the best gifts! Katherine - I have a paper copy that I've had for years, but I got the kindle edition when it was on sale too. Figured I'd more likely read it that way. I do hope you love it when you read it. I hope you do get to see Maleficent. While it was neat to see on the big screen, I think you can enjoy it just as much once it's out on DVD or streaming. I like the "voice" of the narrator in this first paragraph. A little self-depricating, but i like that sort of thing. I'd put this on my list of books I want to read someday. Just kidding - I really do intend to read the book. Some day. Margot - Haha! I know what you mean. There are so many books I want to read--and hopefully someday I will! I have tried and tried to read about Owen Meany. I was probably too young to understand a word of it. Because as I read just now it was such a smooth read. I enjoyed it. Now I want to read it. I guess you always have to give a book a second, third, fourth chance. I would definitely keep reading. I remember the first time I read Pride and Prejudice by Jane Austen. I didn't like it much. When I reread it years later, I absolutely loved it and consider it one of my favorite books of all time now. That must've taken a lot of gift cards, but how awesome! I would possibly keep reading. It would depend on whether I'd liked the summary, I think. On the 'this moment' issue, I find after I've had a few of those I just get frustrated that it gets so close yet so far constantly. If you're thinking of stopping reading it, that may be an idea, or at least put it on hold for a while. Charlie - It was a lot of gift cards. :-) I felt bad for the salesperson who had to ring them all in. I took a break yesterday and read more of Blind Assassin. I have to decide today which I want to read during my lunch hour. I am determined to finish both by the end of the month if they don't get the better of me before then. Paulita - Are those memories good or bad? :-) I imagine good if you still found it worth reading. I admit that I would probably set it aside and then never end up finishing it. I do that sometimes which is why Goodreads currently has me reading nine books. Lol! I hope that you enjoy whatever you end up reading! I feel the same way about A Prayer for Owen Meaney! Glad to know I'm not the only one. Lexi - I finished A Prayer for Owen Meany Friday night. It did get better for me about 2/3rds of the way in. And I kind of can see why so many loved it. I liked parts of it, but not the whole of it. Writing my review of it will be a challenge, I think. I was just popping in to remark on Owen Meany and see above that you've finished it. It took me at least halfway before I started getting into the book and by the end I was absolutely sold but I can see how others aren't quite as enamored. For me it was a case of things just clicking the way that they should...eventually...after a lot of work and wondering where it all was going. I will look forward to your review Wendy! Hope you're enjoying Blind Assassin a little more (even though that one was work, too!). Trish - I hope to polish up my review of A Prayer for Owen Meany tomorrow during some down time at work. I really wanted to like it more than I did. I did like Blind Assassin much better, thankfully.